The GY-LS300 is part of JVC’s 4KCAM line of cameras, which offers up to 150 Mbps 4K Ultra HD recording to SDXC card. The recorded 4K QuickTime mov files can be directly viewed when you connect the camcorder to a 4K Ultra HD monitor. For Davinci Resolve 14 users, you will wish to import the GY-LS300 4K MOV into Davinci Resolve 14 for some editing and color correction. The following article will show you how to get a smooth editing workflow of the JVC 4K footage with this NLE software. Can Davinci Resolve 14 handle JVC GY-LS300 4K footage? The JVC GY-LS300 4KCAM camcorder records 4K QuickTime MOV files compressed with MPEG-4 AVC/H.264. From Davinci Resolve supported file formats, we get the information that the new Davinci Resolve 14 offers native compatibility with everything from ProRes and DNx to H.264, DPX, Cineon, EXR and more. It works with all popular camera formats such as CinemaDNG RAW, ARRI Alexa™ RAW, RED, Canon, Sony and other formats. From above information, we can conclude that you will have no problem to load JVC GY-LS300 4K H.264 into Davinci Resolve 14. Is H.264 codec better for color correction in Davinci Resolve 14? H.264 is an 8-bit format, which means you are potentially compromising your effects and especially color correction and composing gradients. Therefore, if you are going to do many effects editing work of the JVC GY-LS300 4K with Davcinci Resolve, it would be much ideal for you to encode the 8-bit H.264 codec to 10-bit Apple Prores codec, which can process a lot of color data and make the color correction process much easier. 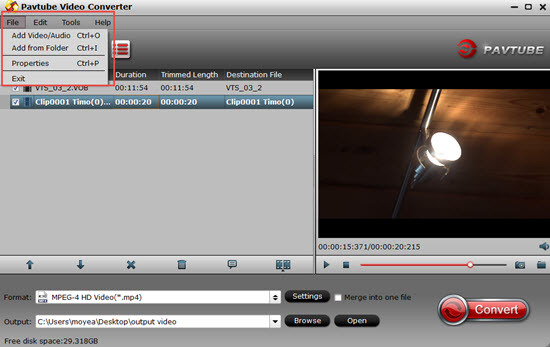 If you are looking for a program to get the job easily completed, we highly recommend Pavtube Video Converter to you. The program can do you a great favor to directly encode GY-LS300 4K H.264 to Davinci Resolve compatible Prores codec in various different file types for better color correction process in the post editing workflow. How to choose the proper Prores format for Davinci Resolve? If your computer is very slow, it would be much ideal for you to choose the Apple Prores 422 LT or Prores 422 Proxy format, which will generate a smaller file size for smooth editing workflow. If your computer is powerful enough, just choose the Apple Prores 422 or Apple Prores 422 HQ format for high quality and high performance editing workflow. Before loading GY-LS300 4K video into Davinci Resolve, you can do some simple video customization work with your video footage. If you don’t want to convert the entire video footage, you can use the trimming tool to cut away unwanted segments from the video, if there are black edges around your video frame, you can use the cropping tool to remove them off. You can also merge separate video into single one with the correct order, split large video files into small ones by file size, count or file length. Or add transparent text watermark to video footage. The program is available on Windows 10, 8.1, 8 and 7. It is accompanied by an up-to-date Mac version Pavtube Video Converter for Mac for macOS Sierra. The program is is very easy to use, no matter experienced user or fresh could handle it very well. In addition, it supports to produce high quality conversion results with better video/audio quality. How to Transcode GY-LS300 4K to Prores for Davinci Resolve Best Color Grading Workflow? Step 1: Transfer GY-LS300 4K video to computer. The GY-LS300 records 4K footage on an SDXC card, you can remove the SDXC card from the camera, insert the SDXC card to a card reader, then plug in the card reader into your computer SD card Port for transferring the video footage to your local hard drive. Step 2: Import GY-LS300 4K video. From “File”drop-down option, select “add Video/Audio”to add source GY-LS300 4K video to the program. Click the “Format” bar, from its drop-down list, select one of your desired Prores format to output according to your own needs. For slow computer, just output “Apple Prores 422(LT)(*.mov) ” or “Apple Prores 422 (Proxy)(*.mov) ” format. For powerful computer, choose “Apple Prores 422(*.mov)” or “Apple Prores 422 (HQ)” for many effects editing workflow. After all setting is completed, hit the “Convert” button at the right bottom of the main interface to begin the conversion process from GY-LS300 4K to Davinci Resolve best favorable color grading Prores format conversion process. When the conversion is finished, click “Open Output Folder” icon on the main interface to open the folder with generated files. Then feel free to load the Prores files into Davinci Resolve for post editing workflow. How to Add AVI to Davinci Resolve for Editing?